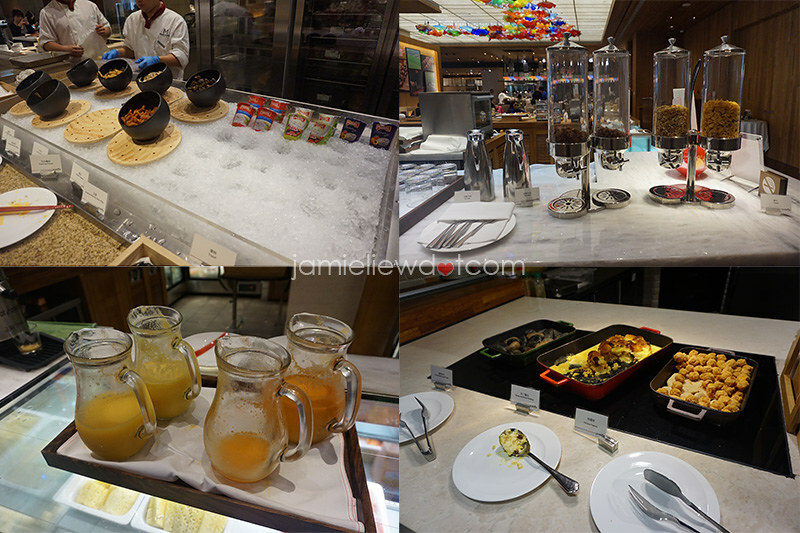 thanks to the Grand Mayfull Hotel, I got two days of very filling breakfasts where they absolutely spoiled me for choices. 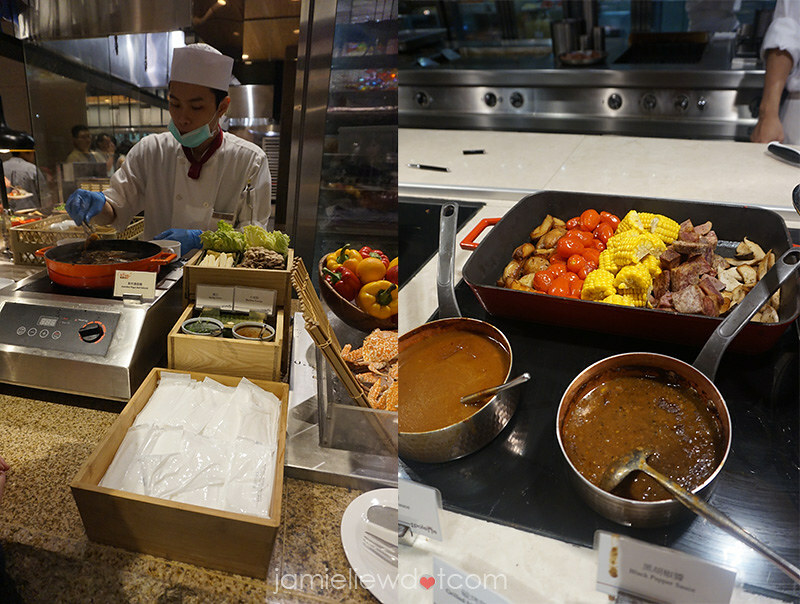 there were a selection of ham, salad, sauces and even the Japanese comfort food; ODEN! they serve only the best type of balsamic vinegar, salt etc. it was definitely very classy. 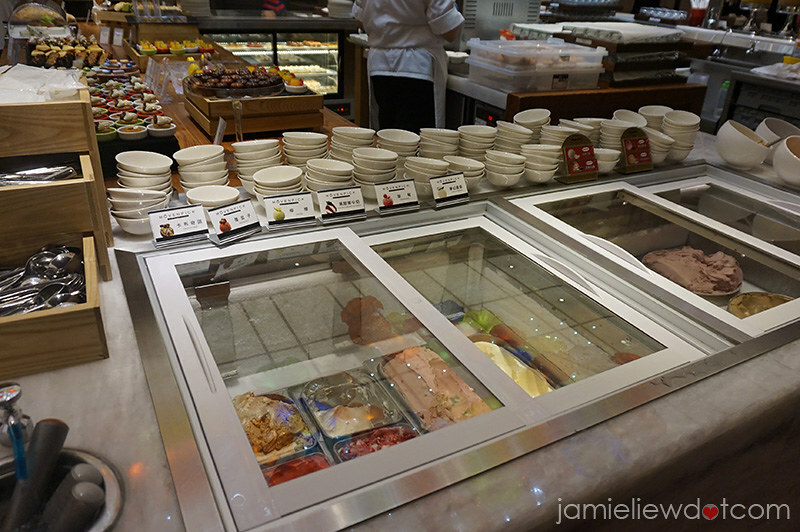 on the other side, you have a whole counter of pickled food and taiwan’s very own chicken floss to go with porridge. there’s also a selection of soba that you can go with different type of sauces and toppings like seaweed, crab meat, cucumber and egg strips. they were not the dipping type but I especially enjoyed the cha-soba with sesame sauce. simply the best! 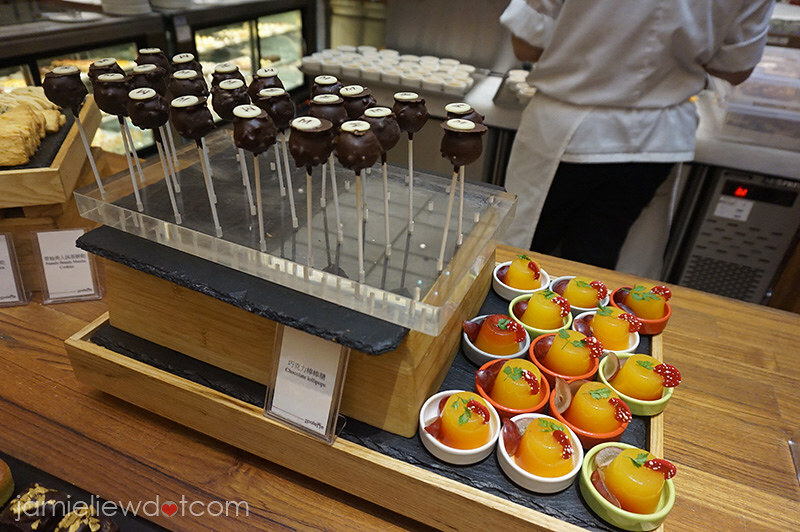 there’s also an array of bomboo trays consisting of baos, cooked pumpkins.. etc. and there’s of course a whole row of cooked food! with both German and Taiwanese sausages! my favourite part’s this though. you get to have freshly cooked eggs on-demand! 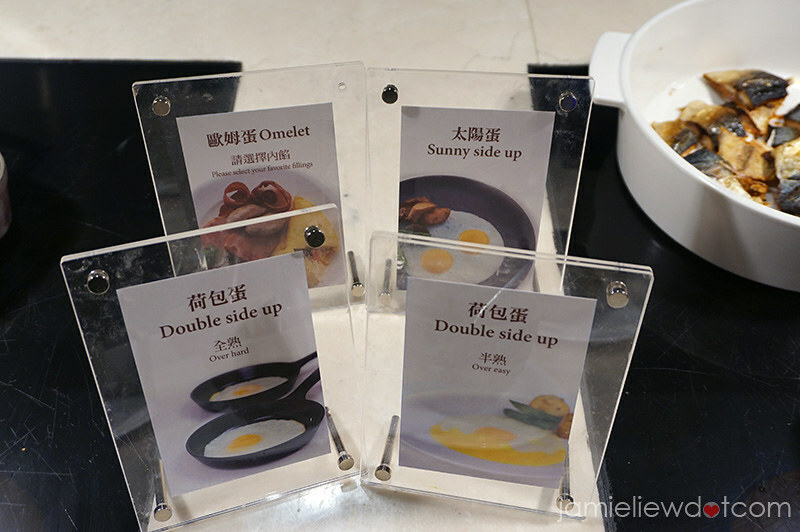 my favourite was the over easy double side up because it’s just delicious with ketchup. 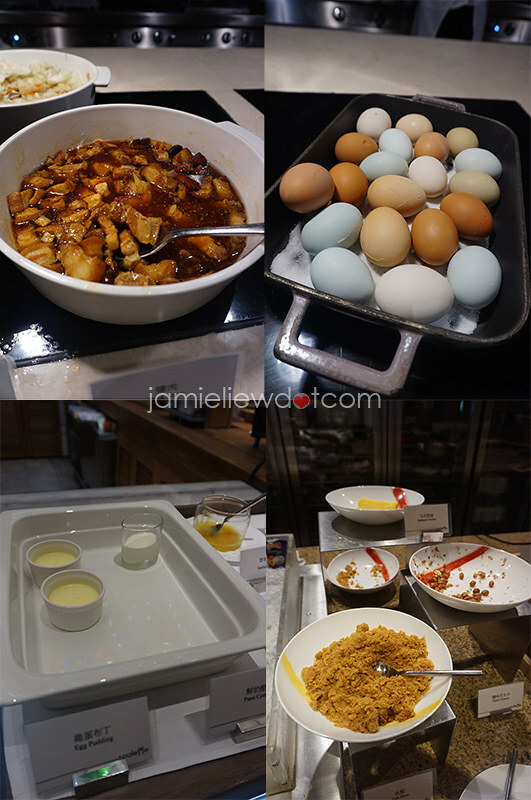 here are some Taiwanese treats like the pork stew, chicken floss, egg pudding and well, just attractive looking salted eggs! they also serve yoghurt for your digestion, cereal, freshly squeezed juice (you can have anything freshly squeezed too!) and my favourite.. the bread pudding. an English special. but tasted so good here. next to it is actually goguma (sweet potatoes) which tasted EXACTLY like those I had in Japan. it’s super soft on the inside and you can just SCOOP the fill out! 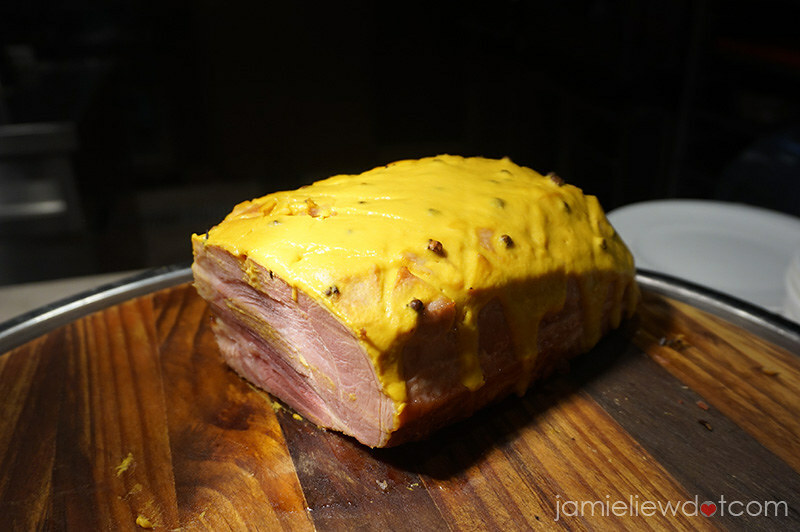 for second round, we had a slice of delicious and tender honey mustard glazed ham. 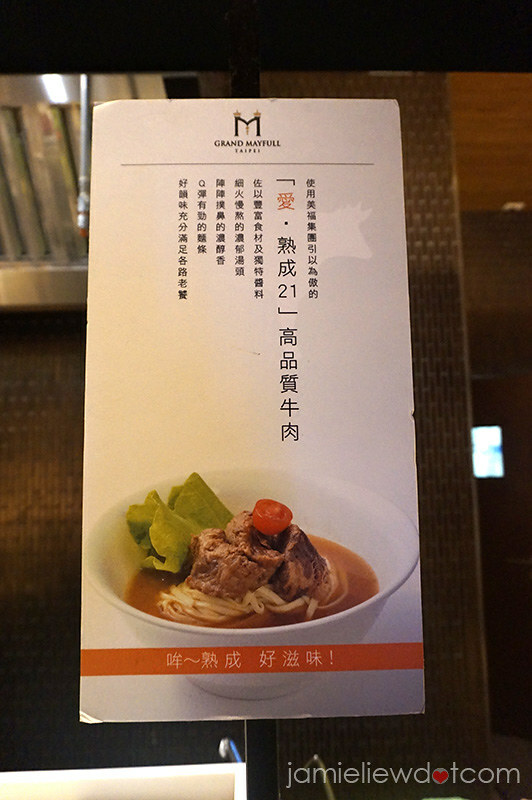 and what the Grand Mayfull is famous for, their Mei Fu beef noodles. FUN FACT! 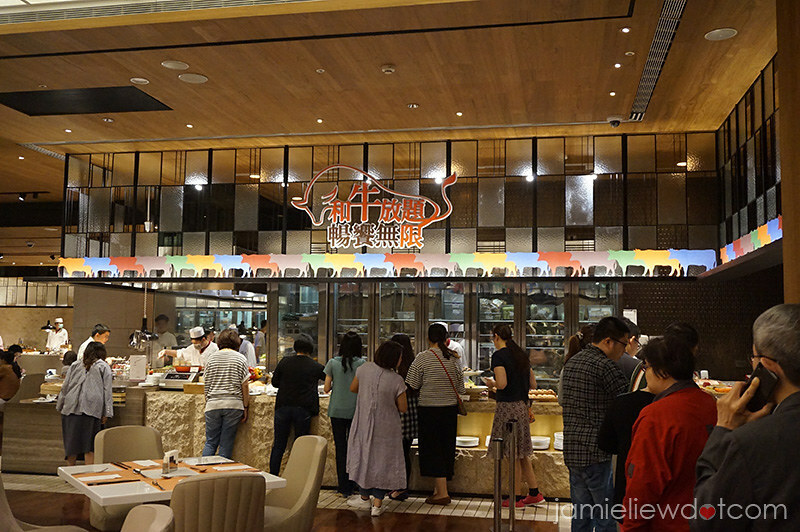 the hotel was built after their success in their famous beef, the mei fu beef. hence, they REALLY take pride in their beef! 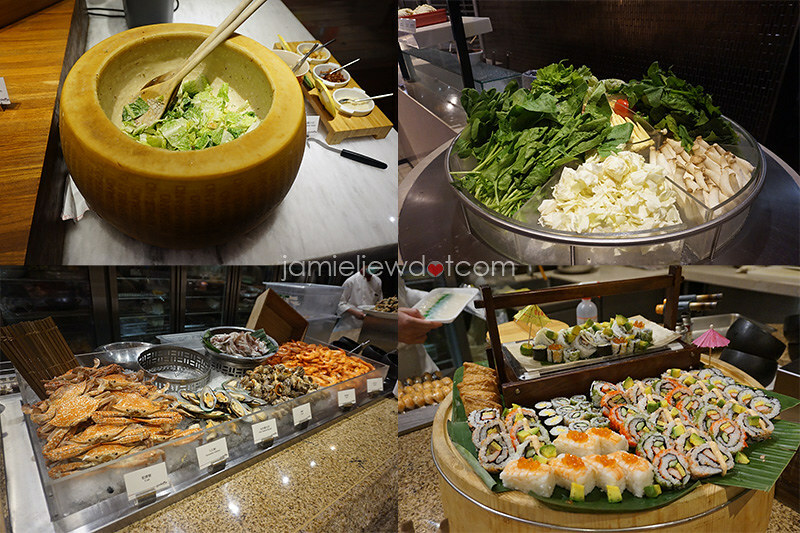 I think that this dish is the best of the entire buffet! you can also pick any noodles that’s suited to your taste. 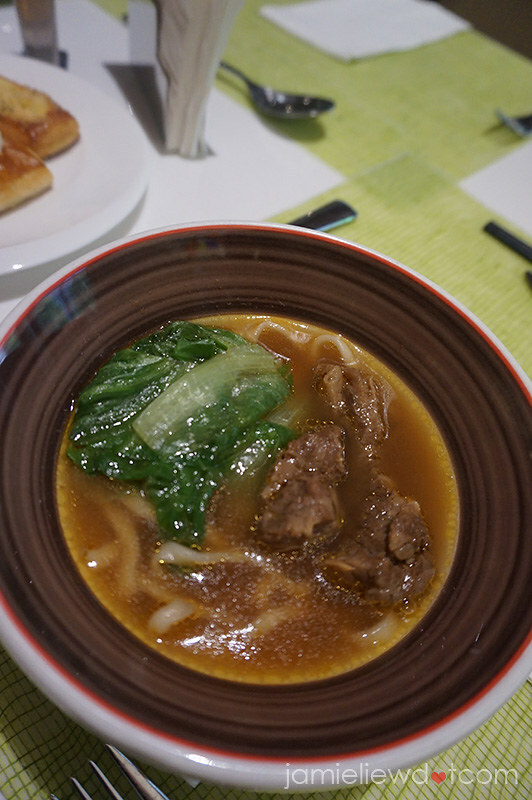 I would definitely recommend the aged beef noodle as I had two bowls of that every morning hahaha. the bowl of noodles isn’t too big. it’s served with two generous chunks of very tender and flavourful beef and some veges. I drank most of the soup too haha. we actually went to a quite famous beef noodle shop but I hated that one (hence will not blog about it. it’s called Niu Dien) and think that this one is 100 times better. OKAY. 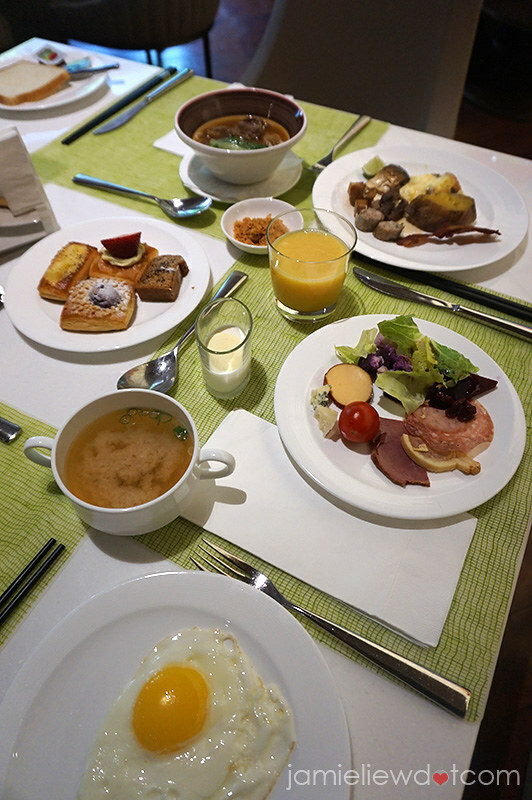 breakfast ends here and lets move to their DINNER menu. there’s also lunch but I ate out haha. so upon arriving at 5:50, there was already a long line in front of me. mind you, for DINNER especially, you cannot come without booking. because it is THAT popular. this was our take for the first round. 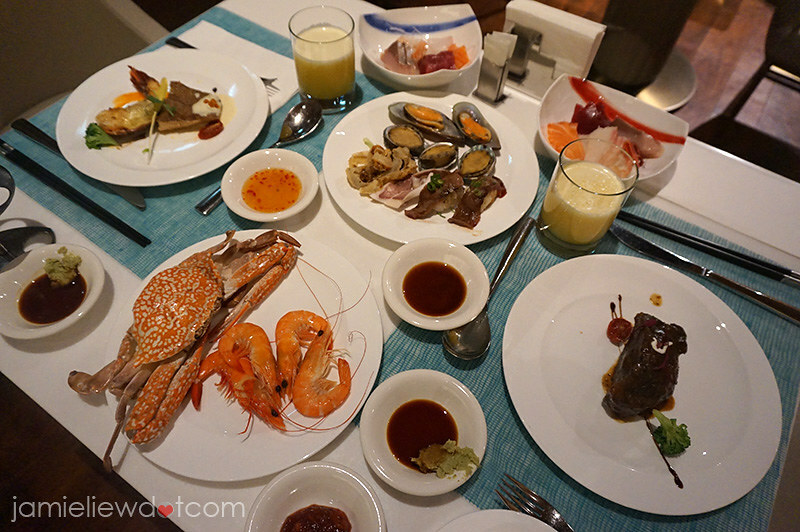 if you have lived in Japan, skip the sashimi and head for the prawns and crabs because they were really delicious. 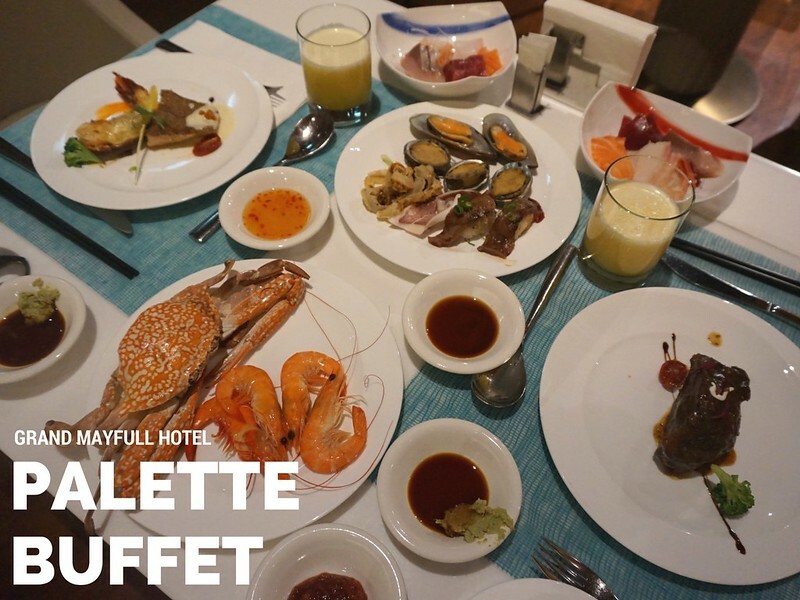 the sashimi was fresh but still it is buffet sashimi, you can’t expect much. and yes, those are wagyu beef sushi. I went on a wagyu month and they had extra more wagyu. but they change every once in a while so stay tuned to their official instagram @ grandmayfull =). they presented us a menu of 5 different dishes upon getting seated consisting of chicken, beef, pork, lobster and fish as I can remember. 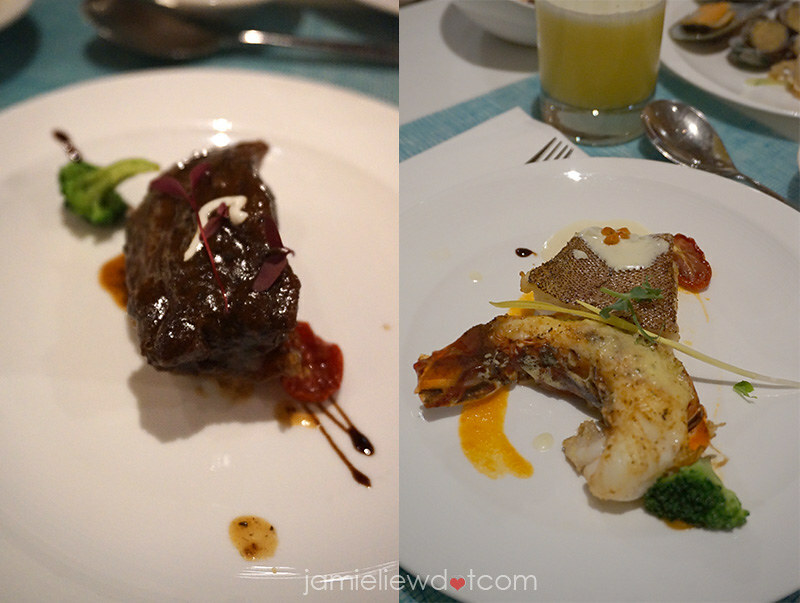 the most popular was probably the Wagyu beef cheek and also the lobster served with cod on the side. it was plated quite prettily and it may look sall in pictures because it was served on a huge plate. but the portions were actually pretty decent. I was 40% full after having this! I really loved the wagyu beef as it was tender and beefy. it just melted in my mouth. so….. good. the lobster tasted really good too especially with that delicious sauce. but I definitely liked the beef cheek a tad bit more! so they have a whole bowl of CHEESE to make their cheesy salad in. while it was delicious, it wasn’t too cheesy. it can definitely do more fish. the seafood bar is crazy. 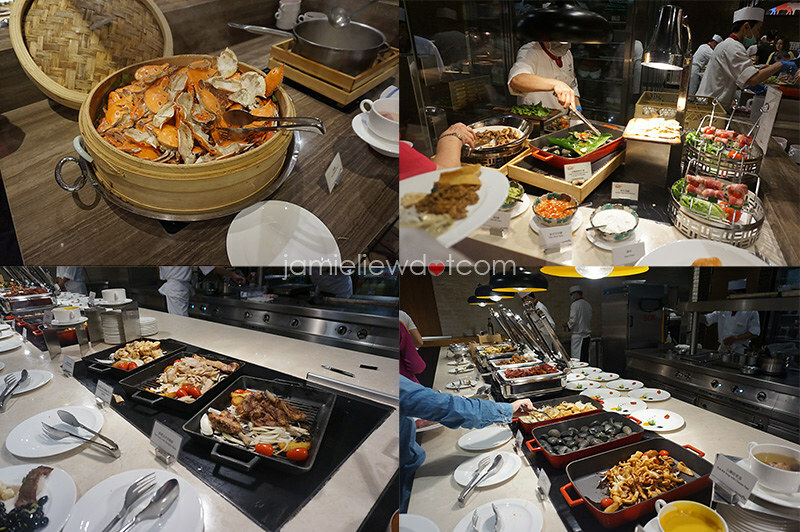 there were prawns, crabs, clams, squid, mussels and even ABALONE!! you heard me right. there are unlimited abalone up for take. but it did taste a little fishy so remember to dip them in sauces. there are also sushi’s which I didn’t take because I was too full. 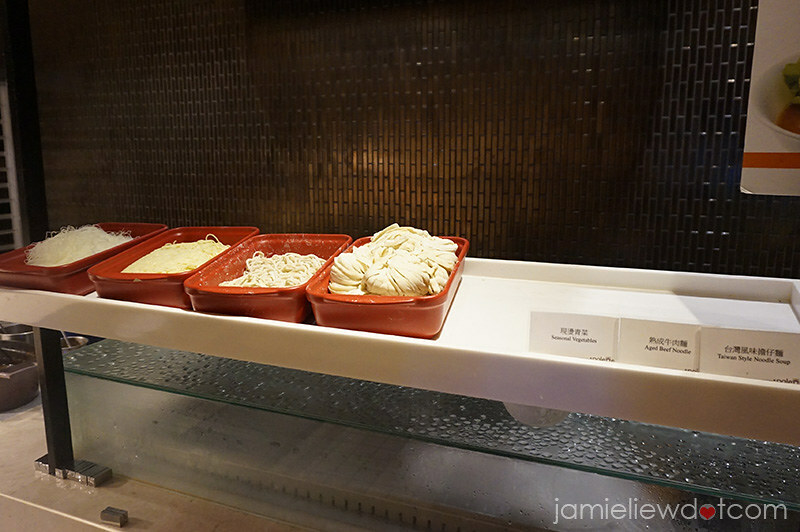 there vegetable bar is mainly for your bowl of noodles which is made for you on the spot. they look so fresh and delicious! they serve quite a wide variety of sashimi. but because I lived in Japan, I am quite picky with my sashimi. it was good but just take one of each I guess. 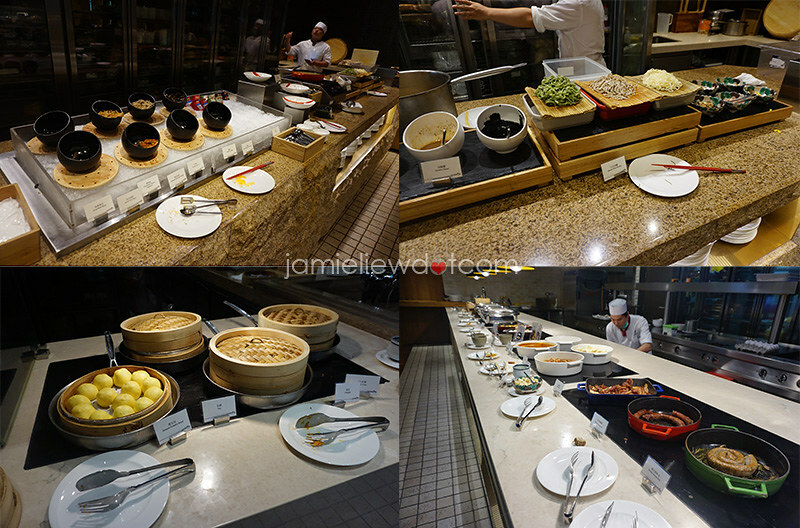 the bottom were just some Japanese side dishes which were mostly made on point! there were also smoked salmon, ham and salad of course. 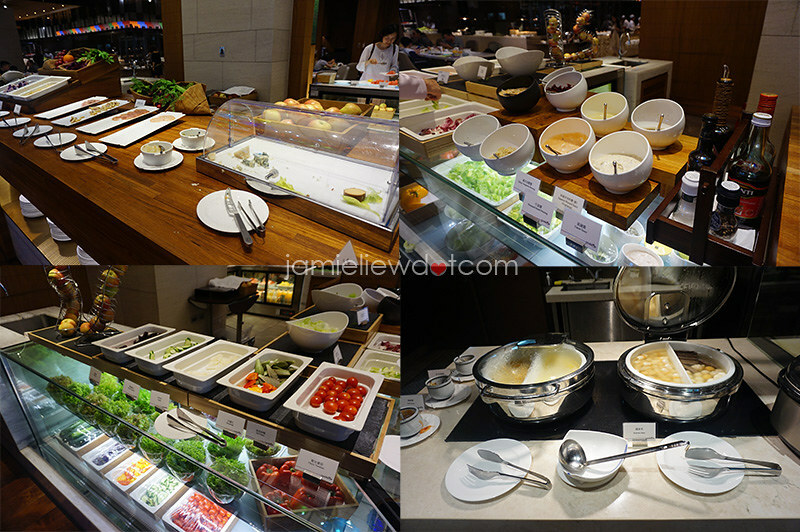 the cheese bar only consisted for 3-4 types of cheese. but brie and blue cheese were all I need. that’s another picture of the seafood now with abalones. haha. 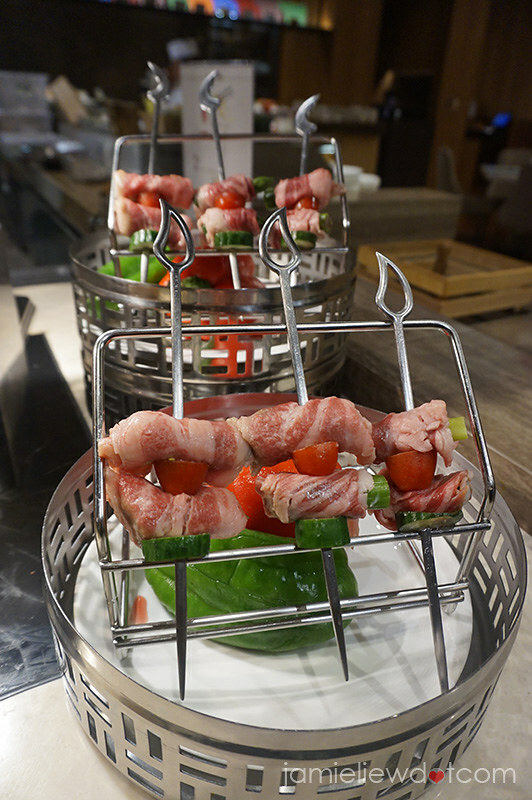 and one of my favourite at the counters, the vege and wagyu skewers! those fats in between simply melts in your mouth. mmm. 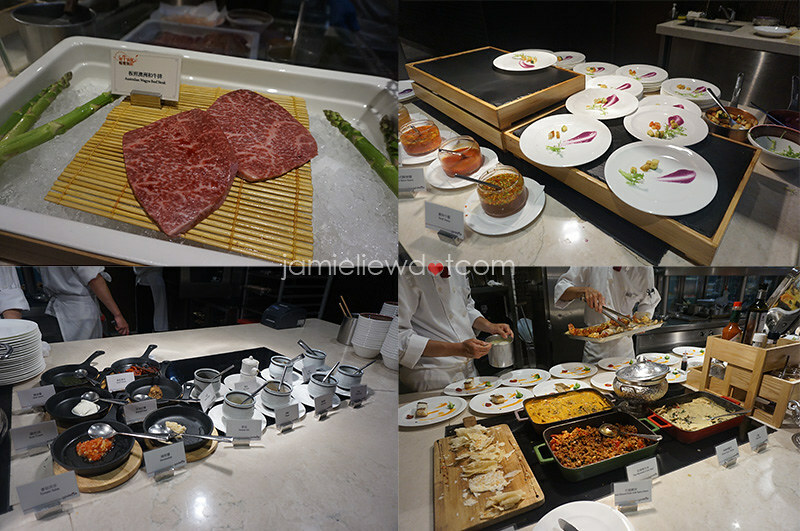 there’s also a sukiyaki bar which looked really good but once again I didn’t have space to try them. there were also curry and black pepper sauce to eat with vege and meat! if cold crab isn’t you cup of tea, there are STEAMED ones too! 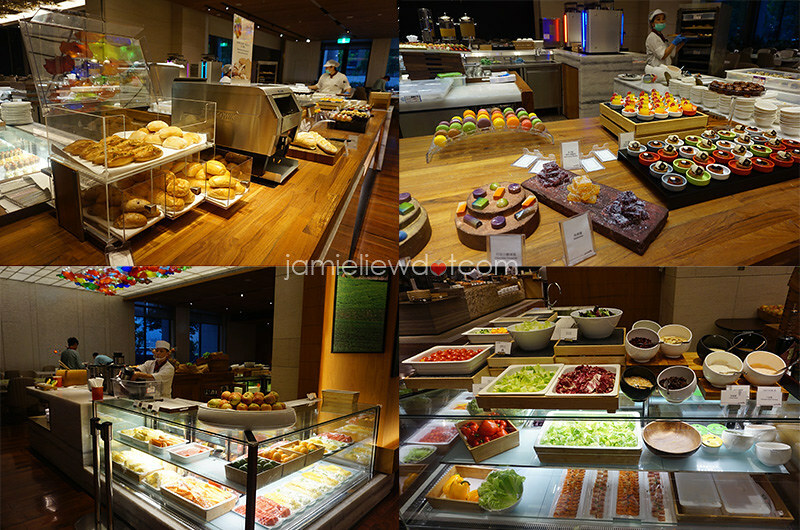 and a wide variety of cooked food to choose from. 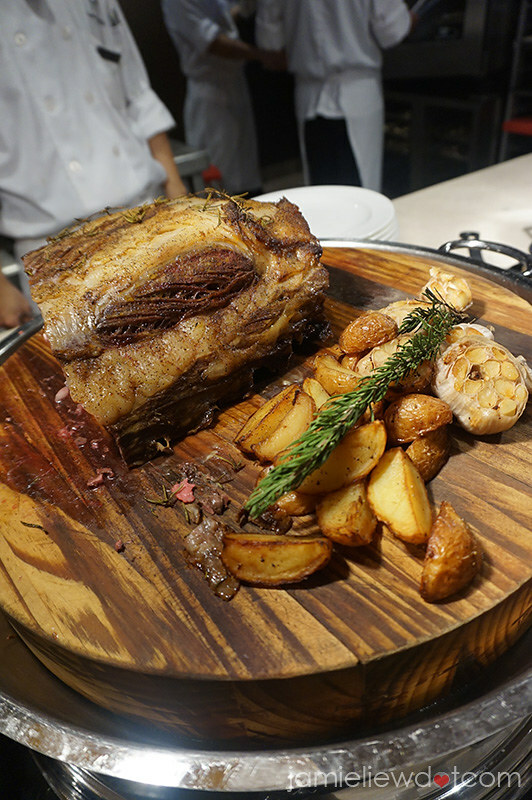 good news for wagyu beef lovers because they serve unlimited beef steaks. I wasn’t a big fan since it was too chewy for me. but I can’t chew most steaks so.. they also have a wide selection of sauce to go with. even sour cream! and moving on to the Indian and Thai food counter, they had some roti, thai curry and even minced meat which I loved! this is a must eat too! the meat was very tender and yummy so highly recommended! something like pho where you put in hot water to cook the meat. but I over cooked it while taking pictures. please do not repeat my mistake T_T. 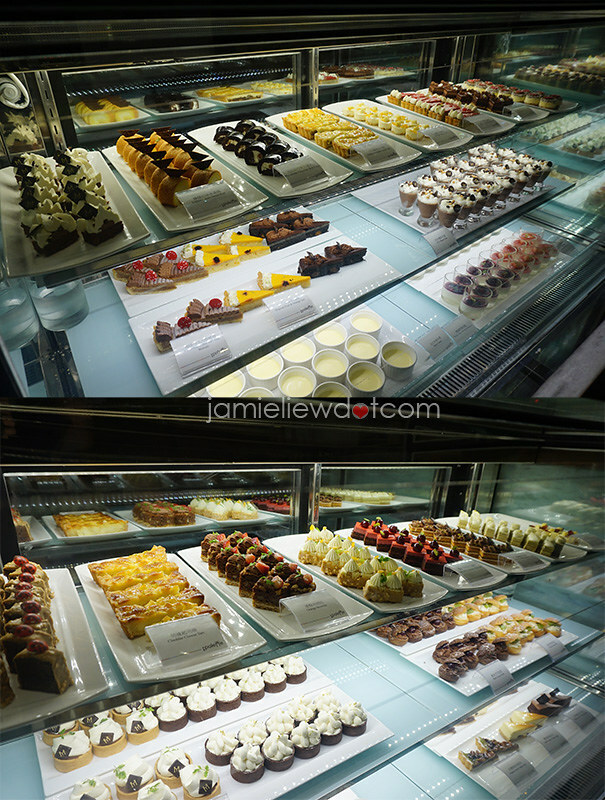 there are also a variety of bread, toast, jellies, (very amazing) chocolates, (yummy) macarons and other french desserts. 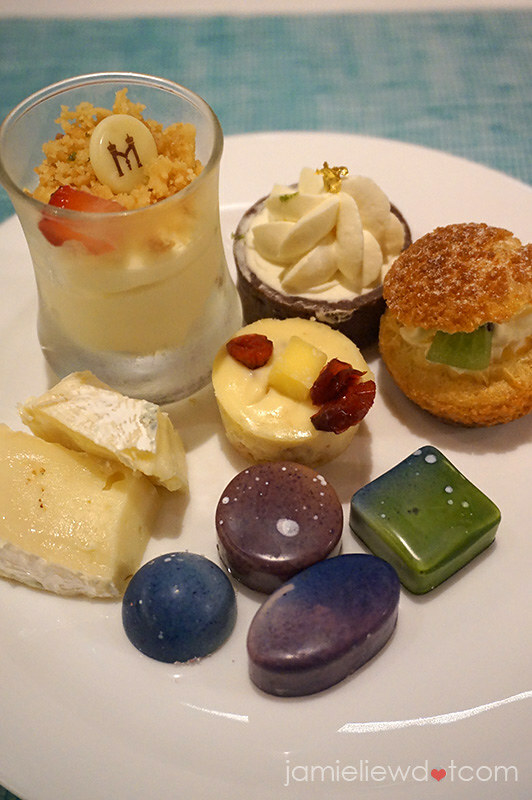 the dessert bar will never let you down so make sure you try as much as you can! as for the fruit bar, you can actually ask them to mix ANY fruit available to make the juice of your choice! I find that very cool. the common salad bar is common. haha. but their veges were of very high quality so I still enjoyed it. and here comes the dessert!! the ones with the write cream on the bottom tasted HEAVENLY. another thing that you must try is their cheesecake. as for the rest, they are still great. but please try my recommended ones! this french dessert though. I forgot the name of it but it was great. 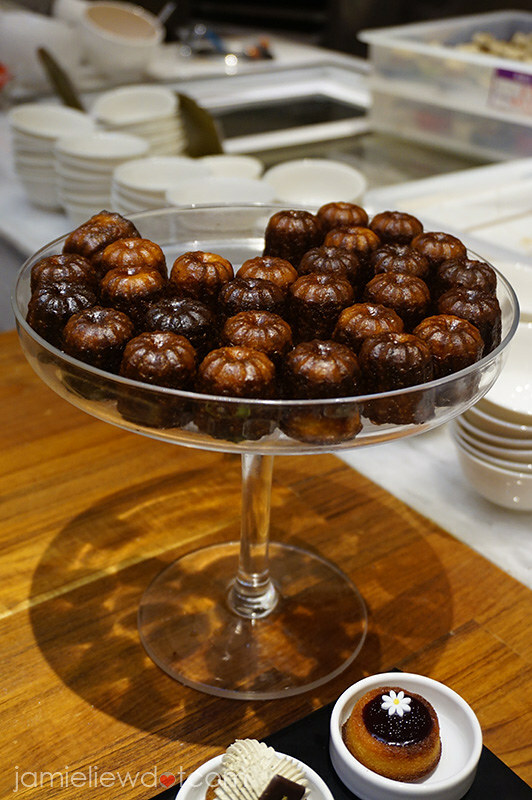 it tastes even better than their madeleines. so crunchy on the outside and soft in the inside. super fragrant and yummy. I had to steal one before leaving the restaurant. mmmm. and oh them glorious chocolates. I had so much. 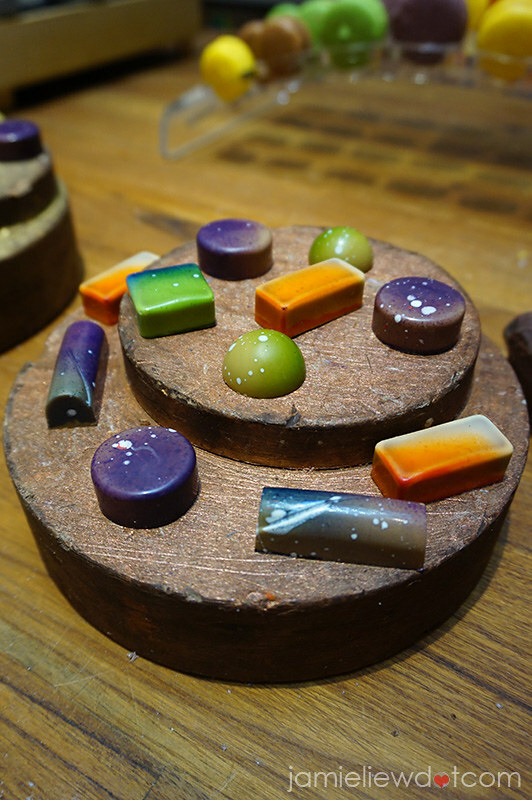 they look like the milky way and the taste phenomenal. just close your eyes and it will transport you to the milky way. it’s so good. I definitely did not expect such high quality chocolates coming from a hotel. and you can eat as much as you can here! do you know what ice cream is better than Haagen-Dazs? MOVENPICK. and these are the two ice cream that they serve. 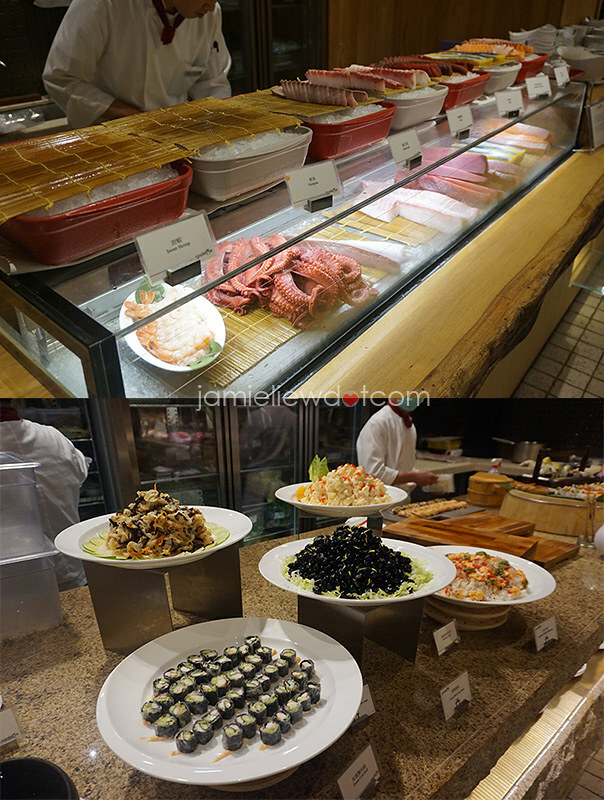 there are also many different flavours in contrast to many other buffets. 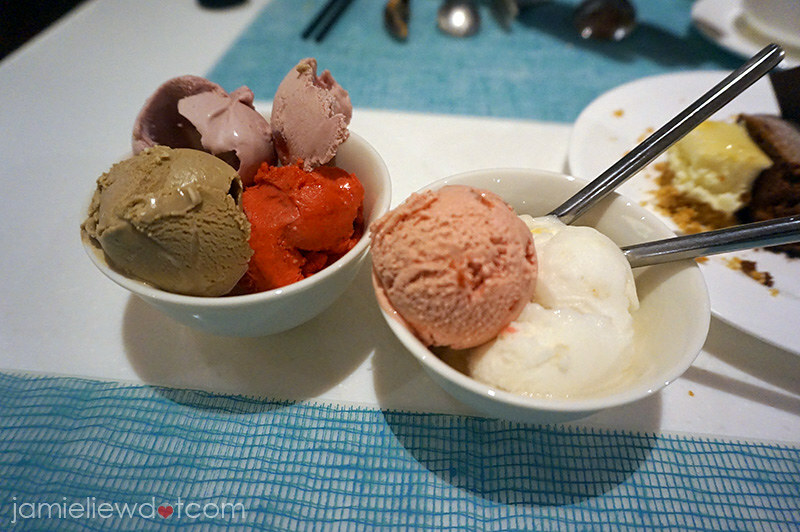 I had strawberry from both Haagen-Dazs and Movenpick but Movenpick tasted so much better. Haagen-Dazs used to be my favourite but it is too creamy and heavy for my liking now. guess what.. they have chocolate lollies! this was a platter of bliss. 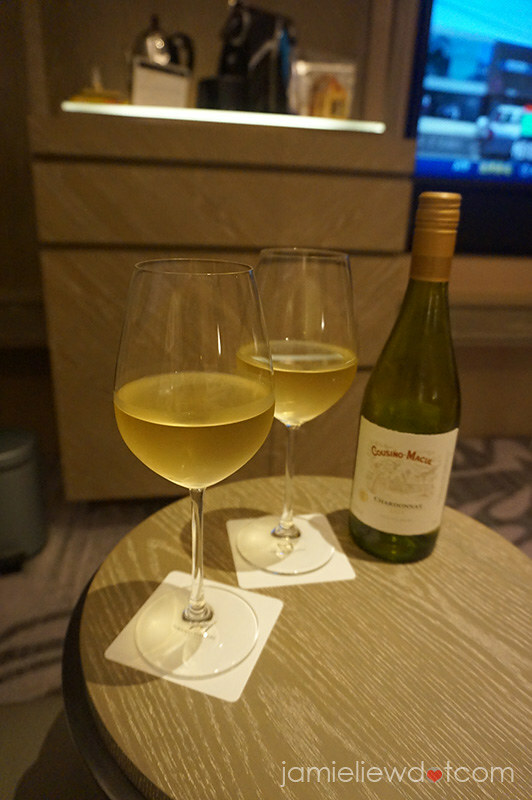 after all that food, we had a nice romantic time back in the room with our white wine to end the night perfectly! 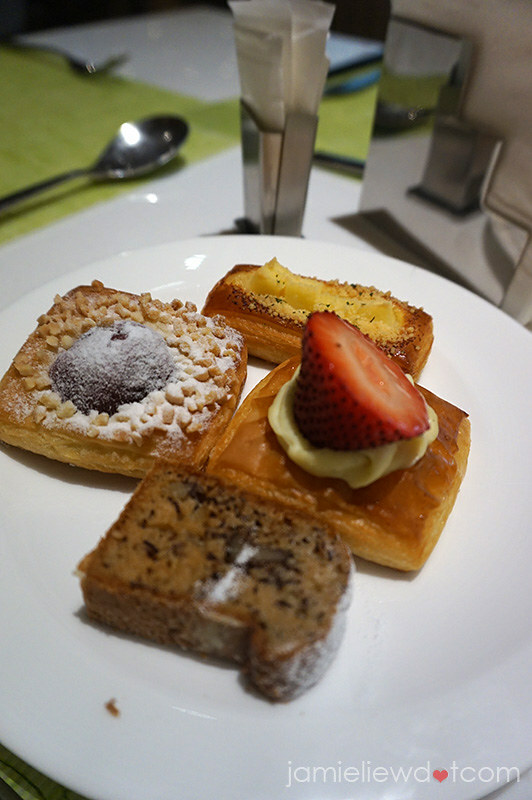 VERDICT: it is a buffet where you cannot finish everything even if you take only one piece of each. 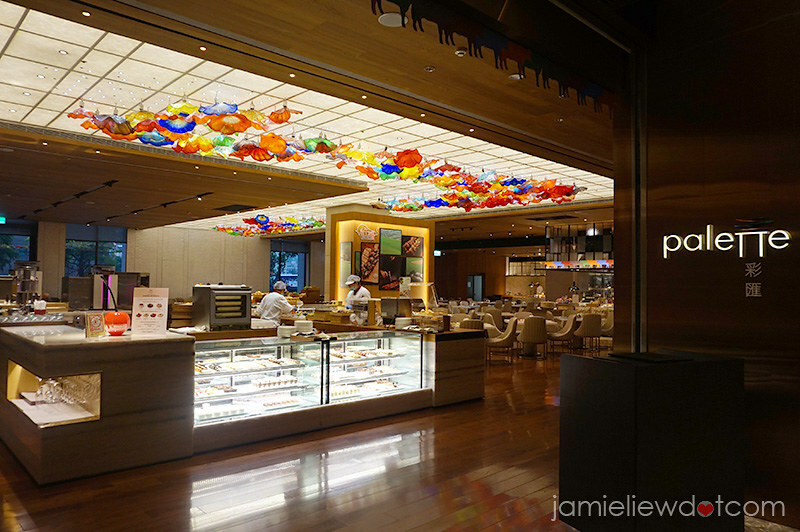 I would say the highlights would definitely be the desserts, made-to-order dishes, their wagyu and them ice cream. 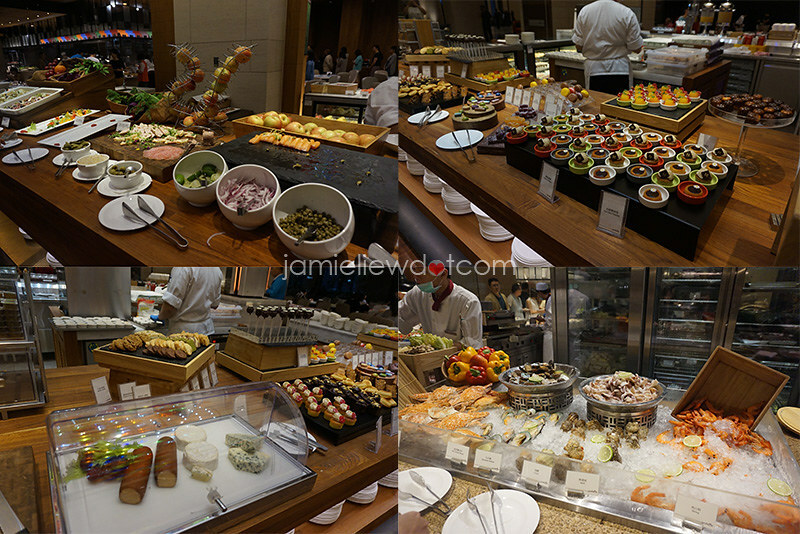 most of the food were of top quality and they definitely offer much more luxurious food items than common hotel buffets. 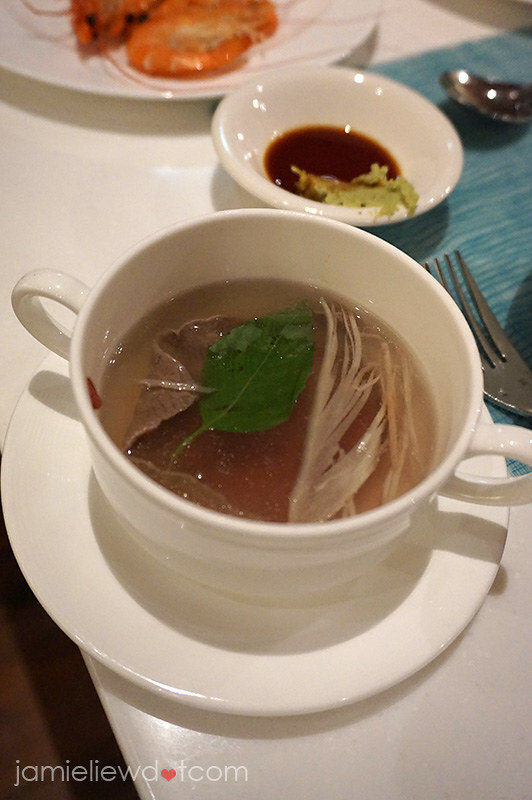 if you have a black hole in your stomach, this place might actually be the best place to go to if you find yourself in Taiwan! 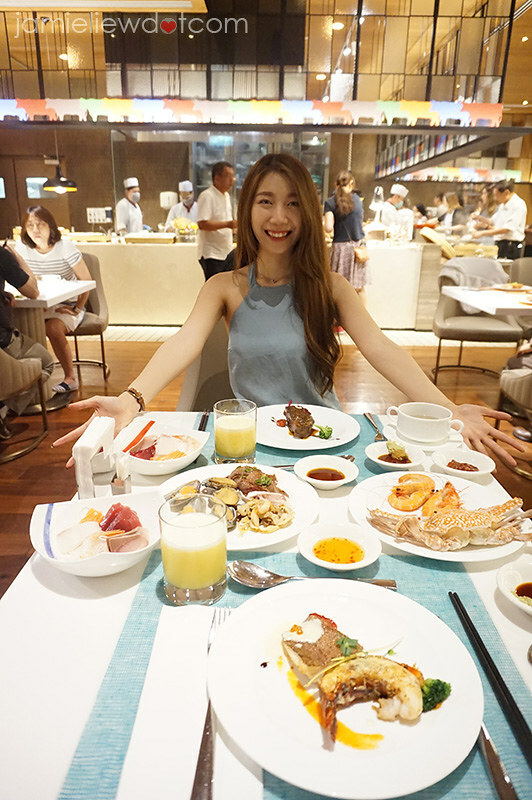 remember, book before you visit as this place is very popular amongst Taiwanese people! Question: Is the meat in ege and wagyu skewers raw? or you still have to cook it?